I indulged at Lower East Side restaurant hot spot, Stanton Social, getting to try many of the specialty treats, by sharing the small plates. 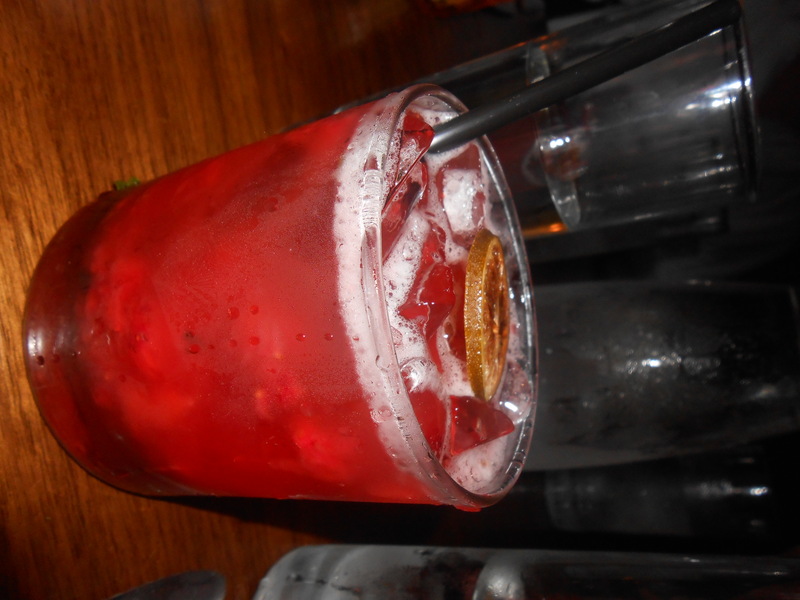 I started off with a non-alcoholic sweet crushed strawberry drink, with a rind of orange. It tasted fruity and delicious. The strawberries at the bottom were a nice touch. 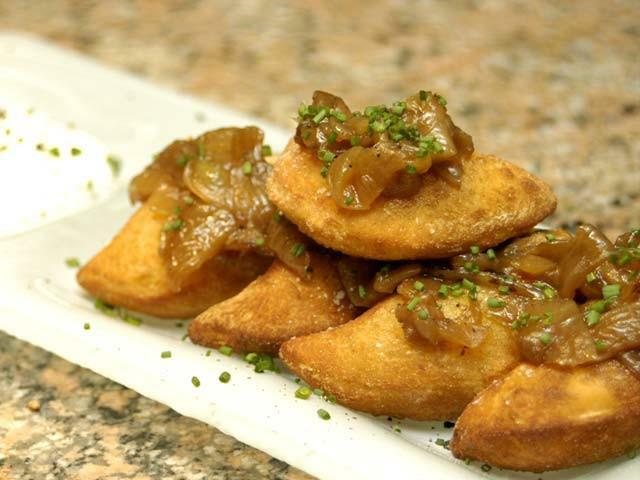 Our feast of a meal started off with potato and goat cheese pierogies, which came with caramelized onion and truffle creme fraiche. 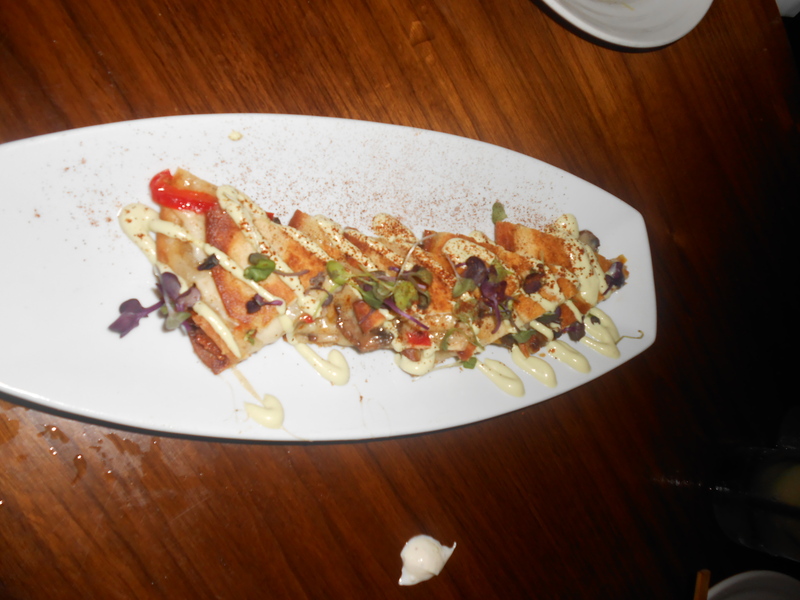 They were melt-in-your-mouth delicious: Crispy and flavorful, the goat cheese and potato were a perfect combination. 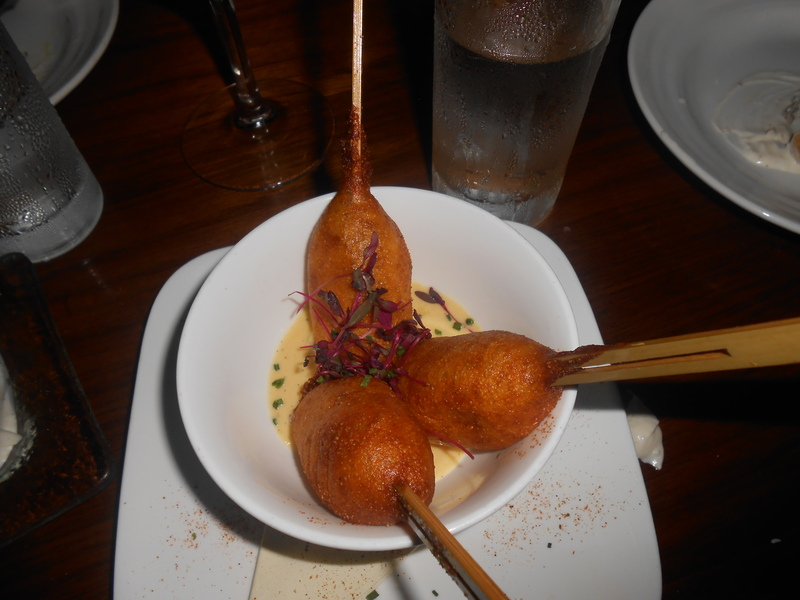 Then the Maryland Jumbo Lumb Crab Cake “Corn Dogs,” which were just okay… The sauce it came with was delicious and complemented the crab cake well, but the overall crab flavor wasn’t very strong. The Mushroom & Fontina Quesadilla was wonderful – the mushroom tasted fresh and of great consistency with the delightfully tasty melted cheese. 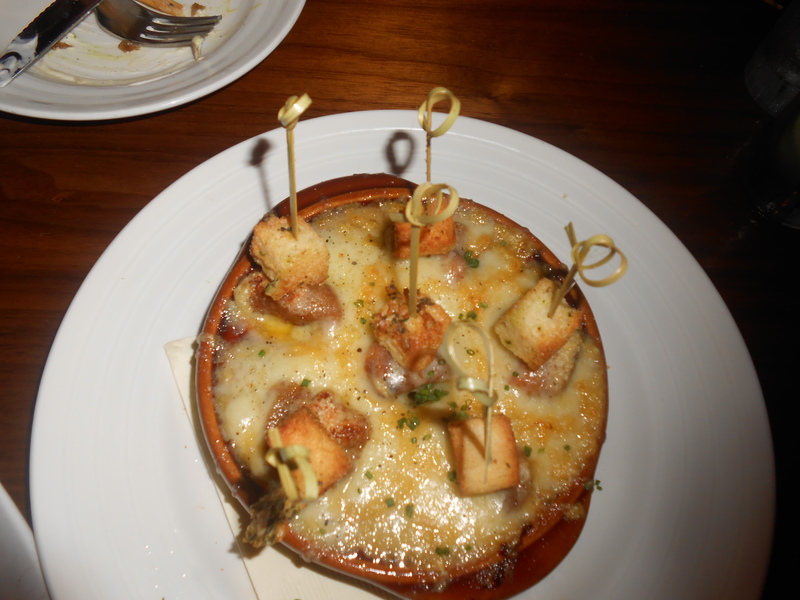 We also had one of Stanton Social’s signature dishes, French Onion Soup Dumplings – A unique and interesting concept that lacks the proper execution. The dish came extremely hot, but the soup got absorbed into the cheese, so it wasn’t actually soup dumplings… It was more like cheesy french onion melded together with croutons on top. The taste was okay, but the texture was bit too chewy and dry. 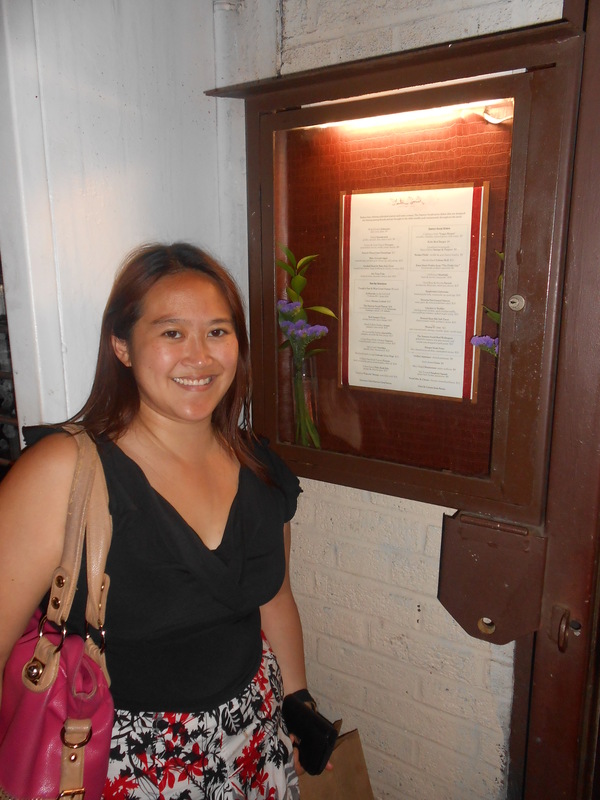 A note to Stanton Social: Leave the soup dumplings to the Shanghainese! 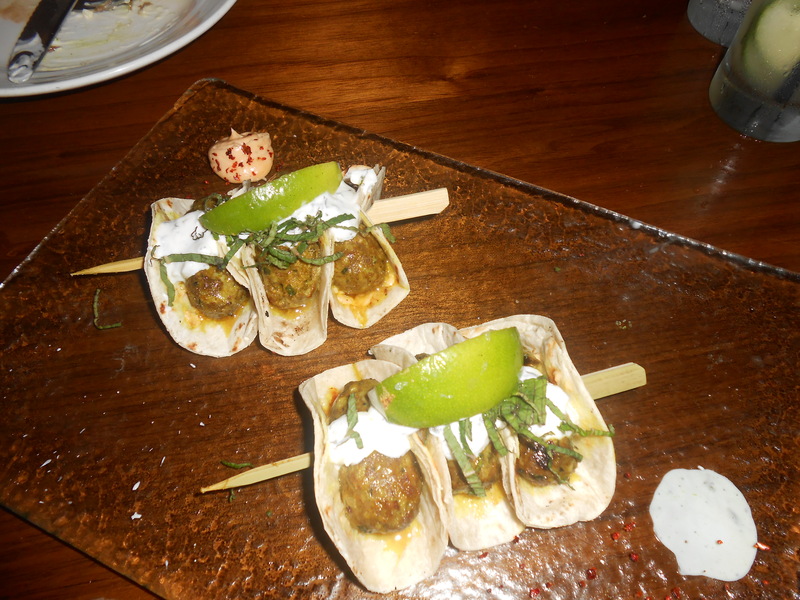 We also tasted the spicy lamb souvlakis, which were unimpressive. The lamb wasn’t spicy at all, the taste was a bit bland and overall not memorable. Then came the entrees. We had to try the Chicken and Waffles. 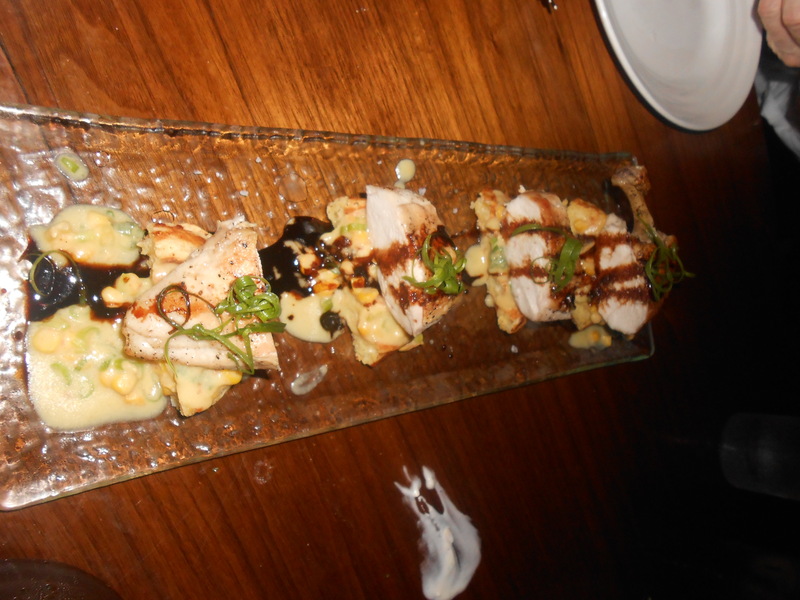 It was brick pressed chicken on aged cheddar waffle, corn pudding and balsamic spiced maple syrup. This was also a disappointment. The waffles were soft and had very little flavor. The chicken were also not great. The next dish, Spaghettini Carbonara, on the other hand, which came with braised pork belly and sunny-side up quail egg, was delicious. 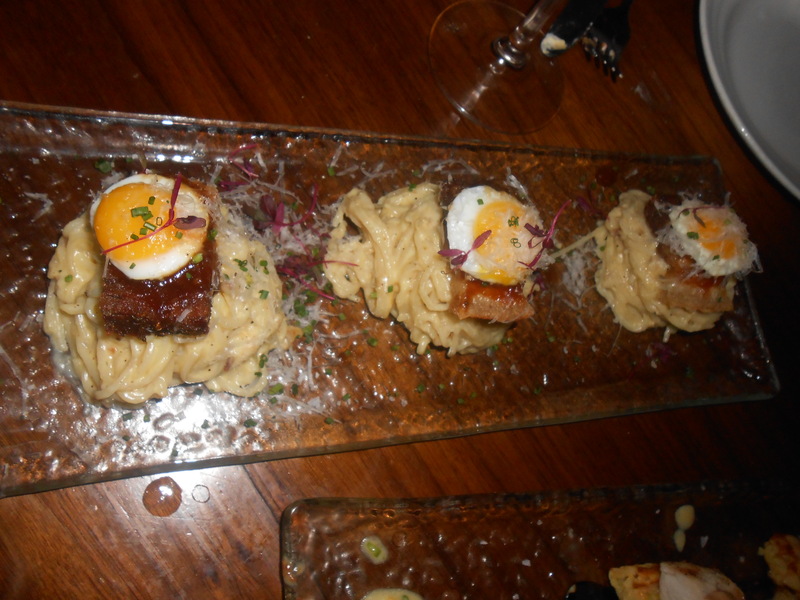 The spaghetti, pork and quail egg were bursting with delightful flavor and combined to make an inspired treat. Then there were the shrimp and grits, which was mediocre to me. 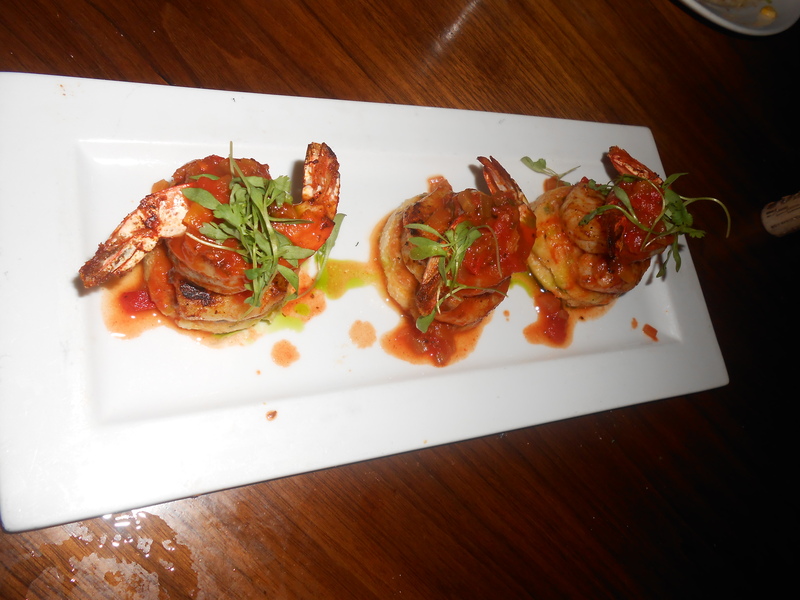 The pan roasted shrimp was pretty tasty, but I could have done without the cheddar grits. 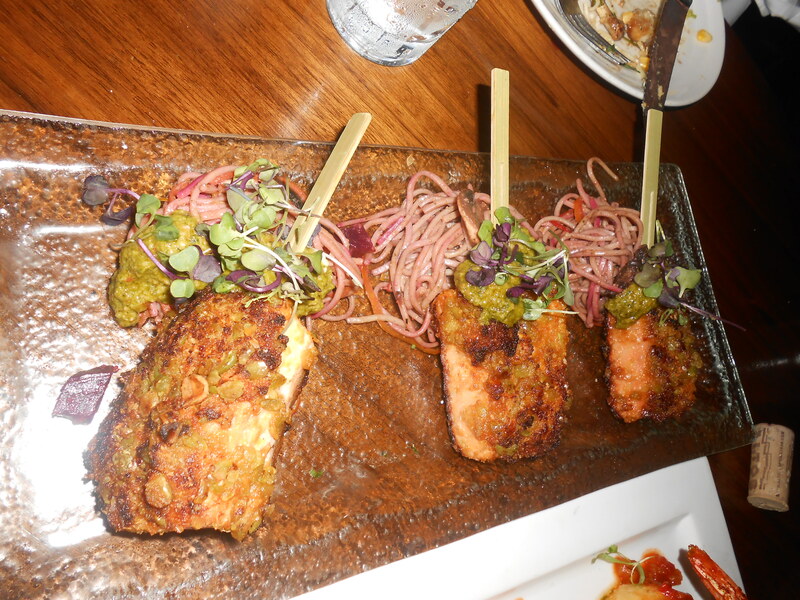 The Sriracha Pea Crusted Salmon, with Asian pesto and soba noodle-beet salad, was simply put, delicious. I loved the crispiness of the crust, the tender flakiness of the salmon itself and the light soba noodle. Everything came together perfectly. 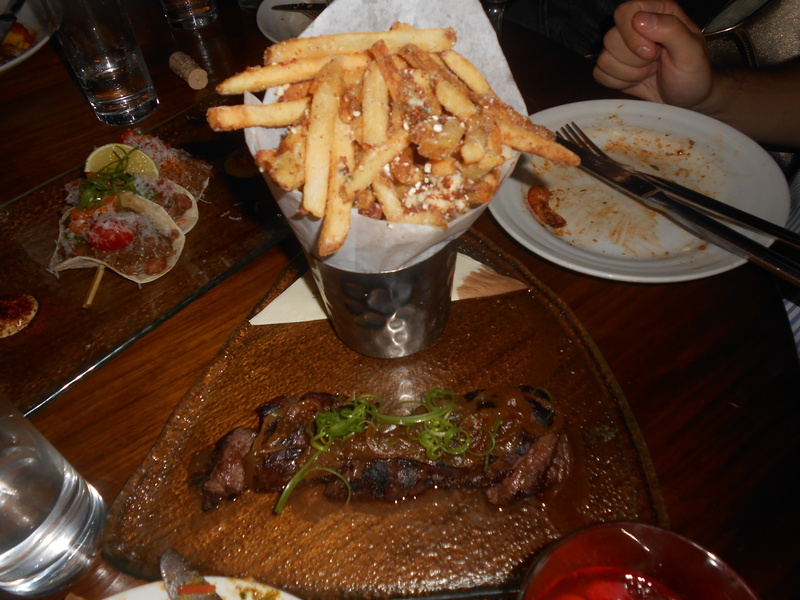 We also had hanger steak. The steak was decent: Nice and juicy, with robust flavor. I also enjoyed the french fries with crumbles of bleu-cheese and bacon, which was a bit much but still tasty, nonetheless. The last main course plate we had were the baby back ribs. The meat was tender and the flavor was good. We couldn’t finish it though because we were so stuffed(! ), so we took the rest to go. 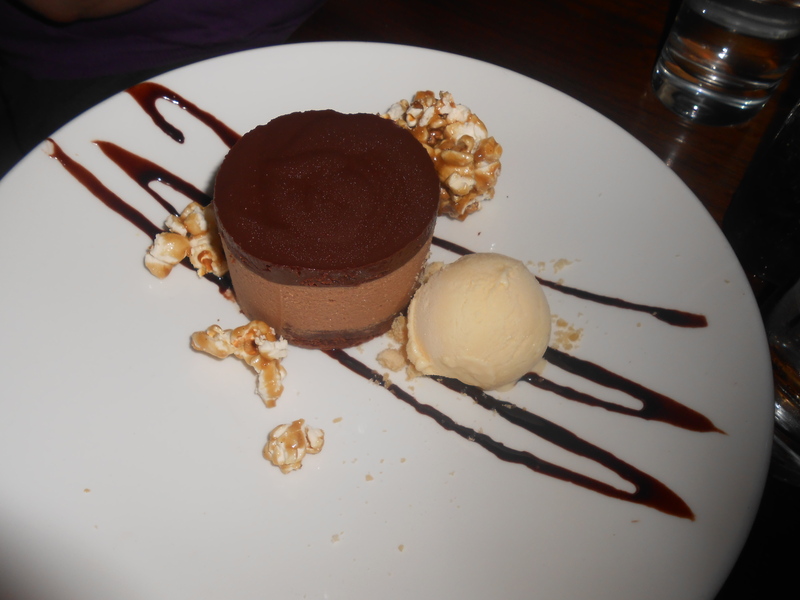 As for dessert, we tried the Milk Chocolate Salted Caramel Mousse, which was delectable. This came with caramel popcorn and popcorn flavored ice cream. The caramel popcorn was quite sticky and the ice cream was light, fluffy, and worked wonderfully with the cake, which was incredibly rich, dense, chocolate-y and divine. We also couldn’t finish this… Next time, I would like to try the S’mores Creme Brulee and Bourbon Peach Cobbler Sundae (bourbon ice cream, roasted peaches, oatmeal streusel).